Qian Zhao-Hong (b: 1947) is a masterful martial artist and teacher in Shanghai, China. He began learning martial arts when he was eight years old and has continued on that path every since, learning from many great martial artists, including Lu Songgao. Master “Q” was a famous fighter, winning many times against skilled martial artists. His nickname was “Chainsaw” because he mowed so many opponents down. As he grew older he more readily appreciated the importance of softness in martial arts practice, and the true and most important values of health and emptiness. My Portland student, Mark has asked me to share why I am so excited to teach the material at my upcoming workshops. It comes from my recent trip to see my teacher Qian Zhao-Hong. In late February, I got news that Master Qian was going to teach a 6 day intensive in Malmo, Sweden from April 5 through the 10th. I was very excited to go and see him again. Long story short, I made an impulsive decision to go. Prior to going to see Master Qian, I thought that I had really made some progress on being relaxed and being more healthy. However, since living in Bellingham, I started becoming very sensitive to the cold and I did not like walking. Anyway, on the first day of the intensive, Master Qian showed me where I was holding my tension in my body and how easy it was to let go and let the body do its own work, without me trying to interfere. 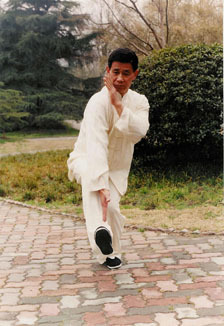 The big thing with Master Qian is being natural and anywhere you are holding tension is unnatural. He taught us how to exercise very actively, aerobically, with the heart pumping, but by his methods we were never out of breath. I also came to understand how to engage my core muscles better. This by the way resulted in an improved stability and relaxed body. Master Qian says that Xin Yi is really a very high level form of Qi-gong. It may look like martial arts, but underneath it you are connecting your main meridians the “du mai” and the “ren mai.” The former goes up the back and the latter goes down the front. During the exercises you connect these meridians — it happens naturally. Also the exercises does something that most Western exercises miss out on, namely, the Xin Yi exercises give your internal organs a massage. So you are circulating your Qi, oxygenating your blood and massaging your organs. The training days went from 9:30 to 5 PM, with lunch from 12 to 2. Instead of feeling tired at the end of the day, we all felt invigorated. By the middle of the camp, I was walking back and forth from the School, where the classes were held, to my Hostel. This was a 40 minute walk each way. I was enjoying it and the cold did not bother me at all. Remember this is Sweden, so it was cold outside. I really feel much more healthy — than I have in years. So I decided upon my return to try to emulate for everyone, the training I went through in Sweden: Qi Gong, exercises, and an overall good feeling in the body. I intend to have the sessions follow the following format: Sun M, work on Qi Gong for energy, then learning the XinYi movements slowly and deliberately to have an active but yet relaxed body, engage the core muscles, to massage the internal organs, and to get an intimate feel of one’s proper upright posture. Sun afternoon, after establishing a foundation, we will work on increasing the number of repetitions of the movements and their speed without sacrificing relaxation and precision. Also we will work on stepping /walking exercises to establish agility and coordination. I will also introduce a couple of two person drills. We will finish off with Qi Gong. I am really excited about this type of training as I think it will benefit us quicker. While I can still remember them, here are some of master Qian´s thoughts. First “master” to Qian’s understanding merely means teacher in English. So he says master. Anyway, first he thinks that a majority of what is practiced as martial arts fails to convey the health aspects of true martial arts. Although some arts are excellent at fighting and hurting people, the practitioners of those arts will live very short lives because they are not nurturing and cultivating their health and improving their bodies. This is mainly due to the reason they do not understand yin-yang in their martial arts or movements. Another important comment he made was that the first reason to practice martial arts is to cultivate the mind: If the mind is calm, then the body will be upright and healthy. If the mind is calm and the body healthy, then you will be happy. If you have food to eat, work, friends, family and a place to live then you are doing great. No need for anything else, as in a bigger house, ipods (he actually did not mention ipods), making tons of money, etc. So the first thing he does when looking at other martial arts is to see if it is grounded in the principles of yin-yang, nurturing the health of the body, and promoting peace of mind. Then he looks at the teacher to see if the teacher is manifesting these concepts in his-her body: Posture is upright, but not with the chest stuck out; and back straight, hips relaxed, standing naturally, moving naturally without any stiffness. So the hardest thing we have found is how to be relaxed but not limp, natural, and use energy for movement instead of muscle power. He really showed us on our own bodies how if we understood natural alignment and being relaxed, our energy will come up and we will be very stable and can easily handle martial skills without even thinking. His basic method was to come over to us and push us over using just his pinky or have another student use their pinky. The he would adjust our posture, point out places where we are stiff and then he would pound on the body, and we would just stand there in our posture without falling over or losing our balance. Very cool. Qian Shifu said that many people understand this stuff in their minds but not their bodies. Also, just to share a little bit, in the morning we would spend at 20 minutes walking dragon hangs it arms, and it was very meditative. I found myself very focused and calm. By the second week, I was able to maintain a focused mind and concentrate only the training and not have other thoughts enter my head. Very cool!